Welcome to our Clear Diamond Blog! Many of us spend large amounts of money on having the latest phone or tablet. You use your phone and tablet on a daily basis, not only for social media and browsing the net but for playing games, using Skype and sending work emails. However, many of us tend to place our phones in our pockets next to our keys, throw them into our handbags or leave them sitting out within perfect reach of a toddler or pet. In these and so many other life situations, your screen faces the danger of being scratched and damaged. The solution to this is to get long-lasting screen protection with Clear Diamond Screen Protectors. They apply easily and help keep your mobile or tablet looking good for longer. These films have been specially developed to provide high performance all round screen protection for touch screens and LCD displays. Once applied, Clear Diamond screen protectors resist any kind of scrapes and scratches however they will not affect the functionality of the touchscreen device. 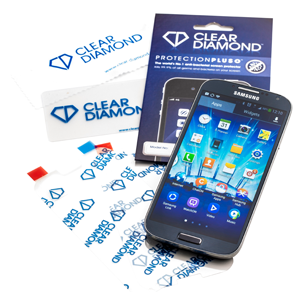 Clear Diamond films are truly unique when compared to other Screen Protectors as they feature a patented Protection Plus+ anti-bacterial, hard-coat surface which aids in preventing the spread of 99.9% of bacteria and pathogens. Are reflections and bright lighting making it hard to see what’s on your mobile, tablet or laptop screen? Are you fed up of tilting your monitor or squinting your eyes to see the screen better? Improve your view with Clear Diamond Screen Protectors. These films have been specially developed to provide high performance all round screen protection for touch screens and LCD displays. Easy to install and featuring innovative optical technology, Clear Diamonds Anti-Glare screen protectors make it much easier for you to see your mobile device screen in challenging and changing light conditions. How Will They Affect My Device? Applied directly to your screen, Clear Diamond Screen Protectors resist scrapes and scratches but won’t detract from your device’s touchscreen functionality. What’s Different About Clear Diamond? With surface options that include glossy, anti-glare, anti-scratch and fingerprint, you get exceptional, long-lasting screen protection that helps you get the most out of your high-resolution device. Not only this but Clear Diamond films are truly unique when compared to other Screen Protectors as they feature a patented Protection Plus+ anti-bacterial, hard-coat surface which aids in preventing the spread of 99.9% of bacteria and pathogens. Check out our “how to” videos on our website that will show you the best way to apply your screen protector with no bubbles or hassle! A healthy touch…protect your screen..protect yourself. superbug antibiotic resistance – more reason to install an antibacterial screen protector to your device!